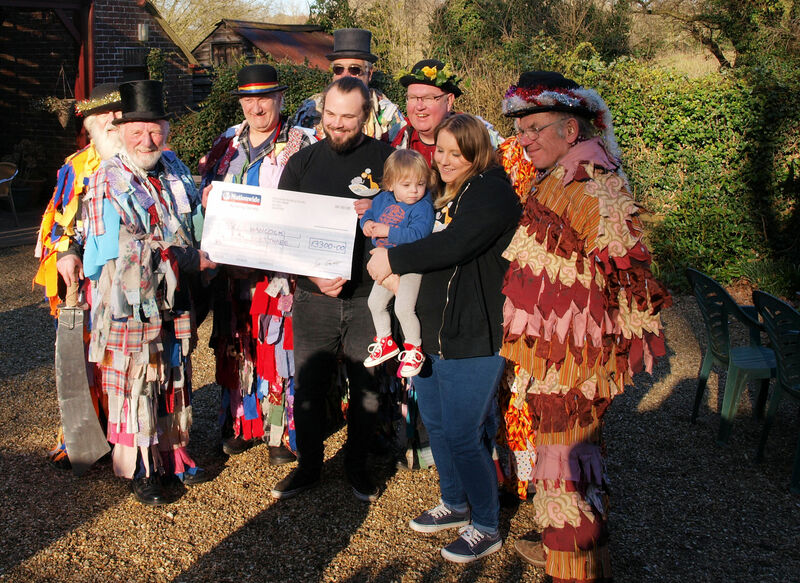 26th December 2018: Thanks to the landlords and landladies of the many hostelries who allowed us to perform, and especially the generosity of their customers, our Christmas 2018 tour allowed us to collect £1,336 which will be used for the benefit of local children with special needs. Details of donations will be added here when suitable cause(s) are found. The Christmas 2018 performance season ended on Sunday 23rd December - for reference the programme can be found here. We have one more perfomance coming up on Thursday 17th January 2019 - at the Wimborne Wassail (private event). The 2017 tour collection of £1,365 was added to our 2016 collection of £1,350, which together with sales of the late Chris Mason's collection of books and CDs of about £650, fesulted in us having about £3,300 to be donated during 2018. Towards the end of 2017 we were fortunate to have been alerted to a fund-raising campaign to provide a physio-vest for a young child, Oscar, from Wimborne who has Cystic Fibrosis (see facebook and crowd-funding pages for more information and donations). The team decided to donate all of our funds to this very worthwhile cause and on Sunday 25th February 2018 we presented a cheque for £3,300 to his parents. The presentation took place at The Vine Inn in Pamphill - which just happens to be the pub where the team meet and rehearse. After the Christmas 2017 performance we had to say goodbye to one of our members, Kev Lowe who frequently played St George, and decided to abandon us for warmer climes - having moved with his partner to Spain. The team was formed in 1979 by members and friends of the Bourne River Morris Men. The object of the performance is to raise funds for local children with special needs, as well as keeping alive a colourful local tradition. Over the years we have raised, and given away, over £37,000 to our selected causes (individual donations ranging from about £100 to over £3,000). During the pre-Christmas season we perform a Mummers play from Sixpenny Handley - click to see the 2017 Christmas programme - this includes links to each of the venues and post codes to help you find your way. During the Easter / St. George's Day periods we also perform a Pace Egging play, based on a traditional play from Kirkby Lonsdale in Westmoreland. We are associate members of the Morris Ring. The origins of these plays are uncertain, but form part of a large body of traditional plays generally known as "Hero - Combat" plays. You can see some comments on mummers and mumming in general here and some more light-hearted comments on mummers can be found on the trivia page. If you wish to contact the team call the leader Alf on 01202 825849 alternatively send an email to: mummers@(please remove bit in brackets to avoid spam)brmm.org.uk. 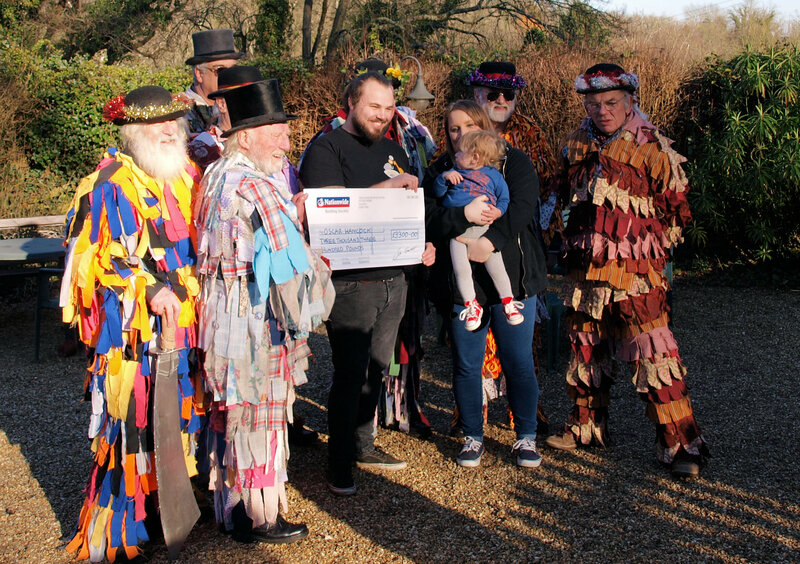 Copyright © 2009-2018 The Stourvale Mummers. All Rights Reserved.